As I said in my last post, after seeing Bill Granger make them on TV, my dad put in a special request for his peanut butter chocolate chunk cookies. Today I made them. 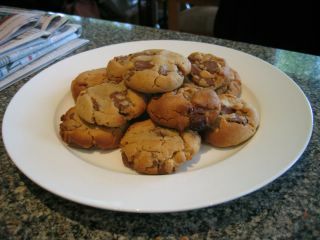 They're pretty much an ordinary cookie recipe, using butter, peanut butter, brown sugar, an egg, vanilla extract and flour. Interestingly, Bill suggests using a bar of good quality milk chocolate (e.g. Lindt) and chopping it up yourself. This worked out quite well in the finished product - in some of the cookies the word "Lindt" was still legible on the chocolate chunks, which impressed my brother greatly. I got 16 cookies out of the mixture, rolling out generous tablespoonfuls into fat circles. They smelled great; and it was very hard not to eat them all before my dad got home from work! Haha! You could still read lindt on the cookies! Awesome.. I love it..